Panax ginseng is one of the several types of ginseng commonly used in herbal medicine. According to traditional Chinese medicine, each type of ginseng is thought to have unique healing properties. For example, some types of Panax ginseng have "warming" properties thought to aid circulation. The active compounds in Panax ginseng are believed to be steroid-like components called ginsenosides. Panax ginseng may aid in diabetes management. In a research review published in PLoS One in 2014, for instance, scientists analyzed sixteen previously published randomized controlled trials focusing on ginseng's effects on blood glucose levels in people with and without diabetes. Most of the trials were less than 12 weeks in duration and included people with relatively good glycemic control. In their conclusion, the review's authors state that ginseng modestly yet significantly improved fasting blood glucose in people with and without diabetes but due to the small size and short duration, longer and larger randomized controlled trials (using standardized ginseng preparations) are warranted. Panax ginseng may improve cognitive performance during prolonged periods of mental activity, according to a 2005 study from the Journal of Psychopharmacology. 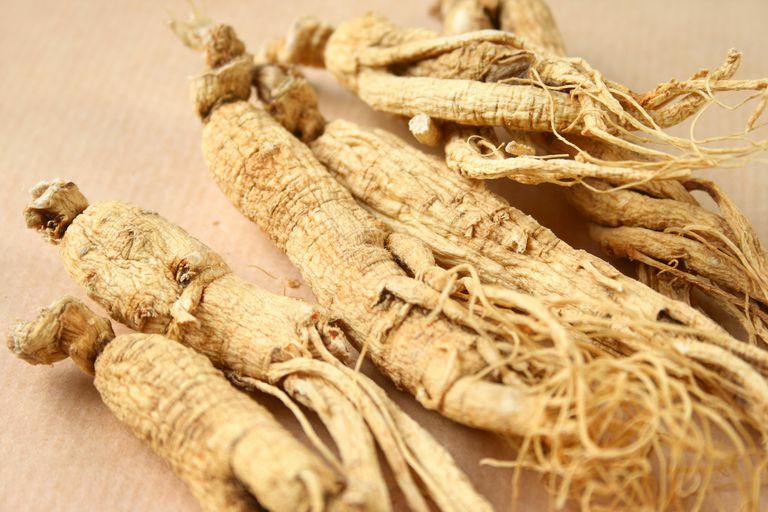 In a clinical trial involving 30 healthy young adults, researchers found that those who were given Panax ginseng were less likely to experience mental fatigue while taking a test (compared to those given a placebo). In addition, a 2000 study in Psychopharmacology showed that a combination of Panax ginseng and ginkgo biloba may help enhance memory in healthy, middle-aged adults. The increase in cognition is thought to be due to lower blood glucose levels and a temporary reduction in fatigue. Panax ginseng may help in the treatment of erectile dysfunction, suggests a 2002 study from the Journal of Urology. In tests on 45 men with erectile dysfunction, those who took Panax ginseng for eight weeks showed greater improvements than those given a placebo for the same time period. In an earlier study of 90 men with erectile dysfunction, 60 percent of the participants reported improvement in their symptoms compared with 30 percent of those using the placebo. The study was published in the International Journal of Impotence Research. Although it's sometimes touted as a cure-all, Panax ginseng may not be helpful for certain conditions. For instance, studies have found Panax ginseng ineffective at alleviating hot flashes and boosting sports performance. In addition, the National Institutes of Health noted that there is not enough research to rate Panax ginseng's effectiveness in the treatment of a number of conditions (including depression, chronic fatigue syndrome, cancer, colds, the flu, bronchitis, fever, digestive problems, fibromyalgia, and anemia). Ginseng is commonly used and is even found in beverages, which may lead you to believe that it's completely safe. But like any herbal supplement or medication, it can have unwanted effects. Some of the more commonly reported side effects include headaches, lower blood sugar levels, nervousness, and insomnia. Ginseng may affect your hormone levels, so if you have a hormone-related condition such as endometriosis, uterine fibroids, or cancers of the breast, ovaries, uterus, or prostate, you should avoid Panax ginseng. Panax ginseng may decrease the rate and force of heartbeats, so it shouldn't be used if you have heart disease (unless you're under the supervision of a healthcare provider). There has been some concern that ginseng may raise blood pressure. Children and pregnant or nursing women should avoid Panax ginseng. Panax ginseng may lower blood glucose levels and it may interact with diabetes medication, so if you have diabetes and are considering using it, be sure to speak with your healthcare provider. Panax ginseng can increase the effect of blood-thinners (anticoagulant and antiplatelet medication such as warfarin, clopidogrel, ticlopidine, heparin, and aspirin), which may increase the risk of adverse effects such as bleeding. Certain herbs (such as danshen, devil's claw, eleuthero, garlic, ginger, horse chestnut, papain, red clover, and saw palmetto) can also increase the risk of bleeding if combined with ginseng. Panax ginseng may affect heart rhythm and can increase potential side effects from theophylline (and similar asthma drugs), albuterol, clonidine, and sildenafil citrate (Viagra). Panax ginseng may interfere with the metabolism of monoamine oxidase (MAO) inhibitors, such as phenelzine sulfate, tranylcypromine sulfate, and isocabaxazid. It's also believed to affect levels of neurotransmitters (chemicals that carry messages from nerve cells to other cells) and may interact with antipsychotic drugs such as chlorpromazine and fluphenazine. Panax ginseng stimulates the central nervous system, so it may increase the effects of prescription drugs that do the same (such as medications for attention-deficit hyperactivity disorder, narcolepsy, and obesity). The combination may raise heart rate and blood pressure. Panax ginseng has been found to interfere with the metabolism of drugs processed by an enzyme called CYP3A4. Ask your doctor to check if you are taking medications of this type. There is no single recommended dose of Panax ginseng. Various doses have been studied in research. For example, in studies investigating its effect on Azheimer's disease a dose of 4.5 to 9 grams of Panax ginseng root daily for 12 weeks was used. In studies looking into its effect on COPD, a dose of 100 mg to 6 grams of Panax ginseng was used three times daily for up to three months. For studies researching mental function, a dose of 200 to 400 mg of a specific Panax ginseng extract (00 to 960 mg as a single dose) was taken once daily or in two divided doses for up to 12 weeks. And for studies investigating flu, a dose of 200 mg of Panax ginseng extract was used daily, starting four weeks before getting a flu shot and continuing for eight weeks after. While Panax ginseng may boost your energy and help in the management of certain health conditions, if you're considering taking it, it's important to consult your healthcare provider first. In traditional Chinese medicine, the way that ginseng has been prepared is thought to influence its action. Red ginseng, for instance, is unpeeled ginseng (Panax ginseng C.A. Meyer) that is steamed before drying. White ginseng, on the other hand, is unpeeled Panax ginseng that is dried and peeled (but not steam-treated). A newer type, black ginseng is made from a repeated steaming/drying process. Red ginseng is thought to promote "yang" energy (which is stimulating and heating), to a greater degree than white ginseng. As a result, red ginseng may be overstimulating for people who tend to feel hot or those who have conditions such as tumors, kidney stones, gallstones, inflammatory conditions, or certain psychological conditions. White and red ginseng are available in tinctures, liquid extracts, powders, and capsules. In traditional Chinese medicine, American ginseng (Panax quinquefolius) is said to have "cooling" properties. This type of ginseng is often touted as a natural remedy for diabetes. American ginseng is also said to stimulate the immune system, improve strength and stamina, and treat and prevent some forms of cancer. Also used to boost strength, stamina, and immunity, Siberian ginseng (Eleutherococcus senticosus) is sometimes taken to ease the side effects of chemotherapy. In addition, Siberian ginseng is thought to act as an adaptogen and protect against atherosclerosis, Alzheimer's disease, rheumatoid arthritis, and attention deficit-hyperactivity disorder. Cardinal BJ, Engels HJ. "Ginseng does not enhance psychological well-being in healthy, young adults: results of a double-blind, placebo-controlled, randomized clinical trial." J Am Diet Assoc. 2001 Jun;101(6):655-60. Choi HK et al. Clinical efficacy of Korean red ginseng for erectile dysfunction. International Journal of Impotence Research. 7.3 (1995):181-6. Hong B, Ji YH, Hong JH, Nam KY, Ahn TY. "A double-blind crossover study evaluating the efficacy of korean red ginseng in patients with erectile dysfunction: a preliminary report." J Urol. 2002 Nov;168(5):2070-3. Shishtar E, Sievenpiper JL, Djedovic V, Cozma AI, et al. The effect of ginseng (the genus panax) on glycemic control: a systematic review and meta-analysis of randomized controlled clinical trials.PLoS One. 2014 Sep 29;9(9):e107391. doi: 10.1371/journal.pone.0107391. eCollection 2014. ​Wesnes KA, Ward T, McGinty A, Petrini O. "The memory enhancing effects of a Ginkgo biloba/Panax ginseng combination in healthy middle-aged volunteers." Psychopharmacology (Berl). 2000 Nov;152(4):353-61.